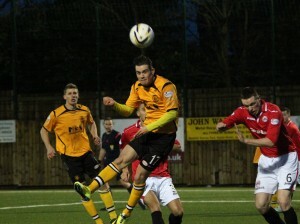 Josh Todd secured the points for Annan with a magnificent bullet header from a Stuart McColm corner in the 61st minute. This was the defining goal in an enthralling match in which Annan on goal scoring opportunities should have won the game long before the final whistle. Clyde on the other hand controlled large spells of the game playing neat controlled football especially in the middle of the park and at the back but in the final third they were fairly ineffective against an Annan defence which defended magnificently to set them up for the victory. Annan boss Jim Chapman bemoaned the fact that injuries had severely hampered his selection options with goalkeeper Alex Mitchell unavailable due a virus , central defenders Steven Black and Steven Swinglehurst along with midfielder Steven Sloan all with long term injuries and the suspended Steven Logan also unavailable. The Annan manager introduced young goalkeeper Jake Gemmell in between the posts for his first taste of first team football and the Annan bench apart from Scott Davidson was all made up from under 18 development league players. Annan started superbly and they went ahead in the 3rd minute when David Hopkirk lashed the ball into the roof of the net from an acute angle after goalkeeper Alan Martin had saved Stuart McColm’s initial shot. It was a great start for Annan and Hopkirk minutes later was unlucky when he latched on to Ryan McStays through ball to finish with a shot which screamed over the bar. At the other end Matty Flynn cleared off the goal- line following a corner. Annan’s purple patch continued with Hopkirk being at the end of all their attacks an in the 8th minute Martin pulled off a superb save to deny Hopkirk and minutes later Hopkirk was denied when his well directed header was cleared off the line. Clyde survived the early Annan pressure to settle down to play some neat football. David Sinclair came close when he rifled over the bar in the 15th minute followed by a David Gray effort in the 23rd minute which also sailed over the bar. Clyde were coming into the game and Annan were having to work hard to contain the Bully Wee. Stuart McColm latched on to a great ball from Ryan McStay in the 30th minute but once again Martin pulled off an important save. Clyde were the team on the ascendancy at this stage in the game and in the 32nd minute the visitors were level. The goal was created down the right and the patient build up ended with David Sinclair glorious low strike form 15 yards ending up in the corner of the net. As the game edged towards half time Josh Todd’s header almost paid dividends with Martin saving the effort and from the resulting corner Stuart McColm blasted over the bar. Clyde started the second half on the attack, Gemmel had to be alert to deal with Scott Ferguson’s 54th minute effort. This was followed by a dangerous David Gray cross. Annan had a real let off in the 58th minute when Bryan McQueen skied over the bar from 8 yards. It was a fortunate escape for Annan but one which they soon capitalised on when minutes later when they won a corner on the right, McColm’s delivery was perfectly placed and Josh Todd intercepted the cross to send in an unstoppable header into the top corner of the net form 4 yards. The goal spurred Annan forward and within the space of couple of minutes Martin pulled off two outstanding saves first to deny Flynn who’s header was tipped over the bar and then minutes later the Clyde keeper pulled off another brilliant save to deny Stuart McColm. Annan were enjoying a fine spell in the game. At the other end Scot Durie finished a penetrating run down the right with a low cross which was cleared for a corner. Annan introduced Scott Davidson in the 70th minute and within minutes he was denied by an important Martin save. At the other end Annan were happy to see Durie’s shot from the right flash wide of the target. Rabin Omar replaced McClom in the 79th minute and and his low cross found Hopkirk who was denied by the alert Martin who once again pulled off an important stop. As the game entered the final minutes Annan had their young keeper to thank when he pulled off an important save to deny Scott McManus when the striker shot straight into the keeper from 8 yards. Peter Weatherson who’s importance to this Annan team was reflected in him taking up 3 positions as his team had to reshuffle due to injuries , almost completed a perfect day in the dying moments when his 30 yard free kick was saved from under the bar by Martin. All in all it was a fine result to end the first half of the season for Annan. Clyde look like they desperately need to find an out and out goal-scorer to finish off their good build up play in order to make them serious contenders for the play off’s. There is not a lot between success and failure in this league with seven teams wrestling between the play offs and the bottom of the league. It will be interesting to see how the second half of the season develops with promotion and play off positions all to play for. ANNAN ATHLETIC: Jake Gemmell, Keiran Brannan (Scott Davidson 70 min), Iain Chisholm, Martin McNiff, Peter Watson, Ryan McStay, Josh Todd ,Mathew Flynn, Peter Weatherson, David Hopkirk, Stuart McColm ( Rabine Omar 79 min) Subs not used Trialist GK, Jordan Brown, Dan Wood, Michael McAnespie, Connor Liddell. CLYDE. Alan Martin, Scott Durie, Craig Halknet, David Marsh, Brian McQueen, David Gray (Kevin Watt 79 min), Scott McManus, Evan Smith, David Sinclair, Scott Ferguson, Substitutes not used Iain Gray, Stephen O’Donnell, Ciaran McBreaty, Michael Daly, Fraser McGhee, Jamie Barclay. GK.